The truth be told, the locals don’t come to Fisherman’s Wharf all that often, perhaps because of all the tourists. But if you look in the right places, you’ll find a few choice local hangouts…the Eagle Cafe at Pier 39, the Buena Vista Cafe (where the Irish Coffee was invented), the Fisherman’s Chapel for Sunday services. One of the joys of creating teambuilding scavenger hunts is to find these local discoveries and share them with our clients. 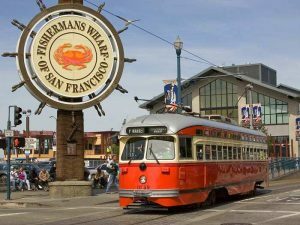 Come to Fisherman’s Wharf for the MANY attractions, but stay for the glimpses into the City’s fascinating past and its local present. Venue Description: Your Dr. Clue corporate teambuilding exercise in Fisherman’s Wharf moves from the classy shops of red-brick Ghirardelli Square down the wharf to the lively attractions of touristy Pier 39. Neighborhood History: It all started with Harry Meiggs. Picking up a load of hardwood in Panama in 1849, the New York lumber dealer made his fortune in the San Francisco of the Gold Rush Era. His 1600-foot pier, replete with bathhouses, saloons and breweries, gave birth to one of the City’s most colorful and notorious neighborhoods: Fisherman’s Wharf. During your corporate teambuilding treasure hunt… you may run into: a chapel for fishermen; a shop of sunken treasures; a submarine used in a film; the largest steering wheel you may ever see. Don’t miss your afternoon of treasure hunting by the bay, followed by drinks and a seafood dinner. See all of our San Francisco corporate team building programs, indoor and out.